A thorough understanding of “seasonal lies” (where fish hold and feed) is mandatory if you plan on being successful year-round. Fishing the correct water greatly increases your odds of catching more fish throughout certain times of the year. A trout’s primary objective is to expend the least amount of energy while obtaining the most amount of food. This concept is imperative if any specific trout wants to survive and grow over an extended period. The actual amount of “feeding time” is directly related environmental factors such as light, insect activity and hatches, water temperatures, and of course time of year. Water temperatures play an instrumental part in the trout’s metabolism, as well as, the insect activity (hatches), which drive the trout’s feeding rhythm. Throughout the winter month’s trout move into the slow, deep pools to conserve energy. The water temperatures are very cold, typically between 34-42 degrees. I have found that anything under 39 degrees is very tough to get fish to eat. The typical feeding window throughout the winter is only a few hours each day. The trout become lethargic, wary, spooky and extraordinarily selective. The bottom line is this—winter trout may only eat heavily once every other day or so during this time of year which leaves very little room for error. After you choose the right water, fly selection becomes important for winter anglers. Midges are the bulk of a trout’s diet throughout the winter months (November through February). Think simple, sparse and most importantly small! Precise dead drifts are mandatory if you plan on hooking fish. Locate small pods of fish (sight nymphing) and fish to specific fish rather than “blind fishing”. A productive day in the winter may be only a few fish, and I will guarantee in most cases you will earn every fish you catch. Typically speaking, winter angler’s fish longer leaders and considerably more lead to get into the prime winter holding areas. The strikes are very subtle and easily missed. Winter anglers must have a keen eye and watch for opening mouths and flashes, all of which indicate a strike. Winter anglers should concentrate their fishing efforts between 10:00 am and 3:00 p.m. because this is the key feeding window. Occasionally you will experience some good midge hatches (especially Elevenmile and the Spinney Mountain Ranch) and some productive dry fly fishing in the slow pools and tail-outs. Take advantage of fly-fishing in the winter, it’s a great time to polish and work hard on technique. It is generally the toughest fishing of the year, and if you can master the basic principles and skills during this time of year, the remainder of the year you should be quite successful. Spring and summer fishing offer fly-fishers a different scenario. After the first couple weeks of March the trout begin to spread out into the riffles once again. Much of this is due to the rising water temperature, which triggers both increased trout activity and the baetis mayflies begin to hatch. 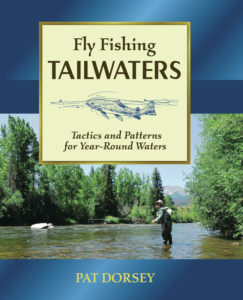 The increased bug activity also increases the trout’s feeding rhythm, which in turn pulls fish in to the riffles. Fish that are located towards the head of a run are there for one reason, and one reason only—to eat! Once again, riffle fish are feeding fish. By the middle part of May, the water temperatures climb to the mid fifties, which is the optimum temperature for feeding trout. Under these ideal conditions you will find the majority of the trout in the fast, oxygenated runs and pocket water. The trout are filling their bellies several times a day and are taking advantage of the best growth period of the year. In some cases the water gets in the 60’s (Elevenmile is a top release dam, and occasionally Cheesman Reservoir overflows through the spillway from excessive snow and rainfall) and fishing gets extremely tough. The other extreme may be a low water year, where low lake levels and streams heat up quicker. In each instance, you’ll find the fish in the real fast water where the oxygen concentration is the greatest. Typically under these conditions fishing will be most productive first thing in the morning (7:00 am to 10:00 am). I carry a digital thermometer to keep a close eye on the water temperatures throughout the year. If the water temperature exceeds 66-67 degrees please refrain from fishing to reduce the stress on the trout. This is especially tough on fish during the hooking and releasing process. From what I have experienced, brown trout can withstand warmer water temperatures than rainbows. The fact of the matter is the fish are not eating much anyway, and you’ll do more harm fishing for them than just voluntarily not fishing. Please use your best judgment and keep in mind the protection of the resource is the most important. The reverse effects take place in the autumn season as the water temperatures begin to dip back into the 40’s and eventually the mercury hits the 30-degree range. Colder water temps decrease trout and bug activity and the fish re-locate themselves back in the slow deep pools preparing for another winter season. This decrease in feeding activity usually starts to take place right after the brown trout spawn in mid October. Mayfly hatches Tricos and Baetis) wind down and midges once again become the primary food source. The feeding window shrinks to only a few hours once again, and precise dead drifts are critical for success.